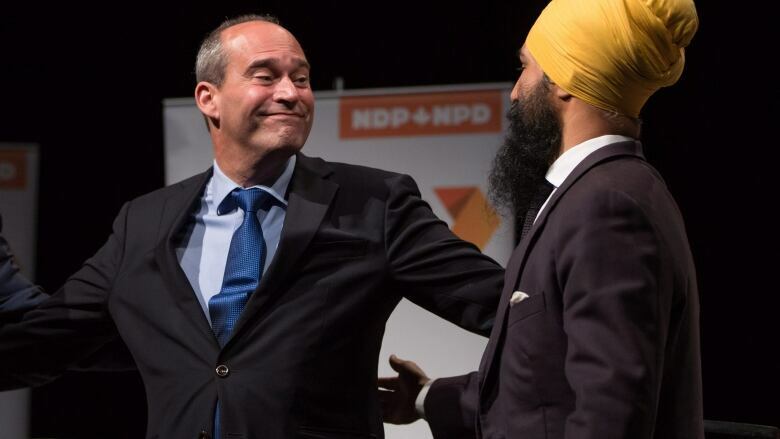 Despite a last-place finish during the leadership race, Quebec MP Guy Caron will be the NDP's point man in the House of Commons, new party leader Jagmeet Singh said today. Despite a last-place finish during the leadership race, Quebec MP Guy Caron will be the NDP's point man in the House of Commons, new party leader Jagmeet Singh said Wednesday. Singh, who doesn't hold a federal seat, made the announcement to reporters on Parliament Hill after his first regular caucus meeting with his MPs. Having the MP for Rimouski-Neigette-Témiscouata-Les Basques leading the party during question period is an acknowledgement of Quebec's importance to the party, Singh said, adding that it was an "easy decision." It will also likely be seen as an acknowledgement that holding on to the province could be a struggle for the new leader. The NDP saw its 2011 Orange Wave dissolve in 2015, when it held onto just 16 seats in Quebec. It won 59 seats in the province in 2011. "I wanted to convey two key things. One, I've always talked about the importance of Quebec. Quebec is incredibly important not only to my party, not only to all New Democrats, but also to the progressive movement," Singh told reporters. "Also I wanted to select a parliamentary leader [who] reflected the thoughtful, progressive values in a meaningful way. Someone who is qualified and used the time as a candidate to connect to so many Canadians." Singh said the other leadership contenders, MPs Charlie Angus, Niki Ashton and Peter Julian, who dropped out in the summer, will be reintegrated into critic roles soon. He also said there will be an announcement on the House leader and party whip jobs soon. Singh, who has been an Ontario MPP since 2011, said he would consider running for a federal seat before the next election, but needs to find one that has an "authentic connection" with him. "I'm comfortable right now with the fact that I don't have a seat," Singh told reporters Monday. "Other New Democratic leaders that have been incredibly successful, like [late leader] Jack Layton, haven't had a seat and have spent the time getting to know the issues that matter to Canadians." The Bloc Québécois operates with a similar model of parliamentary leader in the absence in the House of leader Martine Ouellet. Singh, 38, won the NDP leadership on the first ballot Sunday, taking 53 per cent of the vote. Wednesday marked the NDP's first weekly caucus meeting since Singh's win. "It was an unreal experience to now be at the head of the table," Singh said. Angus was noticeably absent at caucus on Wednesday, tweeting that he was heading to Elk Lake in northern Ontario for the anniversary of a saw mill. "Charlie is an incredible member of our team," said Singh in response to questions about Angus's absence. Singh said Quebec MP Pierre Nantel attended a dinner with Singh and NDP MPs Tuesday night, adding he gave Nantel a hug in Wednesday's meeting. During the NDP's leadership campaign, Nantel told Radio-Canada that Quebecers don't want to see their leaders wearing visibly religious symbols.